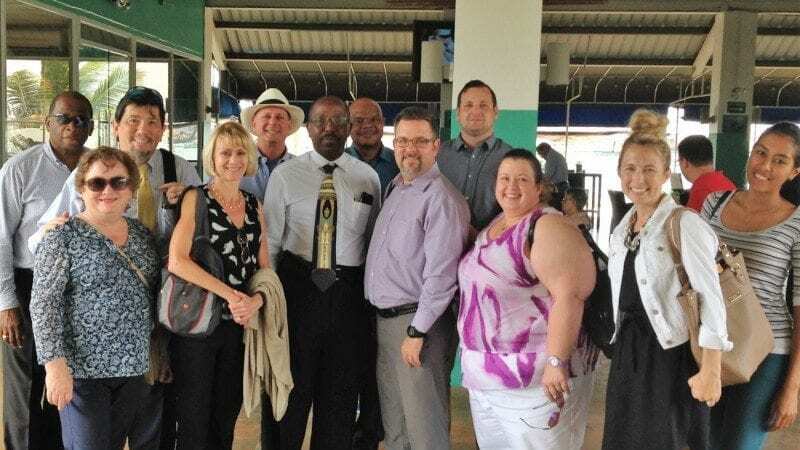 During their visit to Panama, Polk State students, representatives of the Central Florida Development Council, and Madrid Engineering Group President Larry Madrid met with attorney William E. Lewis (front row, third from left) for an overview of Panamanian business law. Polk State’s trip to Panama has been described as an academic/trade mission. 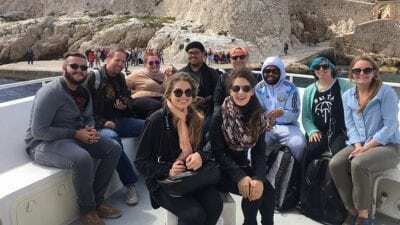 The first of those two adjectives is easy to grasp: students learned about international business by meeting with Panamanian firms and touring the Panama Canal. But what of the trade portion of that descriptor? What exactly does that mean? For that answer, spend a few minutes with Larry Madrid, president of Bartow-based Madrid Engineering Group. Madrid’s interests here were two-fold. For one, Madrid Engineering Group specializes in geotechnical engineering for the foundations of structures as varied as homes, buildings and bridges. Panama is currently experiencing a building boom — numerous cranes interrupt the Panama City skyline — and Madrid would like to offer his services to developers. Secondly, Madrid and two partners have developed a new type of insulation system called Greenstar Panels. The product, recently patented, combines a radiant heat barrier, a convection channel, and insulation. The panels fit directly below a structure’s roof, expelling heat that would otherwise make its way into living spaces and raise energy costs. While in Panama, Madrid set up a meeting with the City of Knowledge Innovation Center, a business incubator located on a former U.S Army Base, to explore resources that may be available to help him expand into the country. He also met with William Lewis, a Panamanian attorney, for an overview of the business law in the country. Waiting for his departing flight, Madrid reflected on what he will take home with him to Polk County. Madrid said he had already made several phone calls to contacts in Polk County, including those in solid waste management. Madrid, as evidenced by his energy-efficient paneling system, has an interest in environmental issues. Several times during the trip, it was mentioned that Panama’s landfills are insufficient for the amount of waste the country is producing. Madrid thinks Polk County may have the talent needed to solve the problem. Madrid is still contemplating expanding his business into Panama, but even if he chooses not to, this trip will change the way he operates back home. For instance, a visit to Top Manage, a business management software company based at the City of Knowledge, made Madrid think about relationships with clients after jobs are done. “Certain things that Top Manage is doing to make their customers happy were good for me to hear. They have a different system of customer management and follow-up than we do. They have someone available to answer questions at all times. Sometimes the best way to handle business is to go back to the previous business and mine it again. Your previous clients like you, they like doing business with you. Let’s go back and talk to them again. There may be some opportunities there,” he said. While Madrid was representing his own interests in Panama, Sean Malott, vice president of the CFDC, and his colleague, Senior Project Manager Spiros Balntas, were here, essentially, representing the entire Polk County business community, scouting opportunities and partnerships to help grow enterprises back home. He added that this trip serves as a fitting precursor to the development of the Polk Global Trade Alliance, an organization that unites educational institutions, including Polk State, and businesses to explore export opportunities. This academic/trade mission to Panama, Madrid said, is proof of the great things that can happen when private businesses, higher-ed institutions, and economic development agencies work together.